Wattle (Acacia spp. ): growing, planting, caring. Oh the smell of mimosas ! Scientific name : Acacia spp. Acacia, commonly known as the wattles or acacias, is a large genus of shrubs and trees in the subfamily Mimosoideae of the pea family Fabaceae. 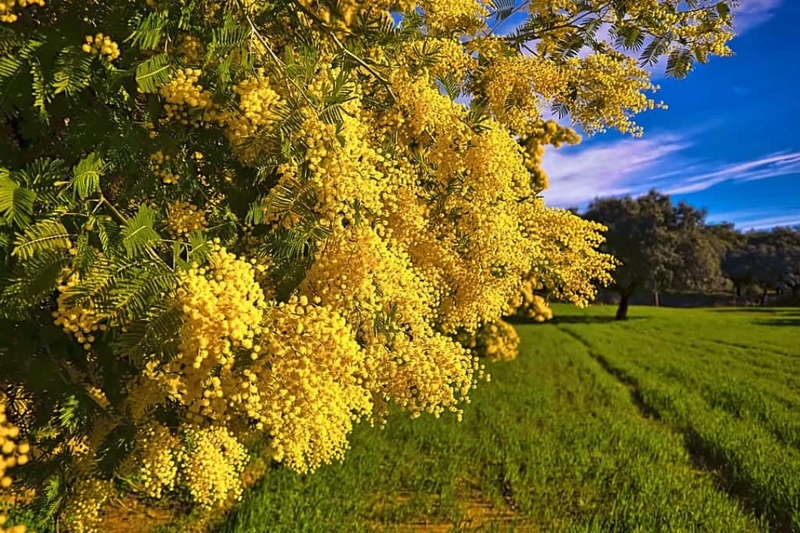 Acacia dealbata - known as silver wattle or mimosa - is one particular species, native to southeastern Australia and widely introduced in Mediterranean, warm temperate, and highland tropical landscapes. It is a fast-growing evergreen tree or shrub growing up to 30 m tall, typically a pioneer species after fire. The leaves are bipinnate, glaucous blue-green to silvery grey, the flowers are produced in large racemose inflorescences made up of numerous smaller globose bright yellow flowerheads. A tree with evergreen foliage, composed and bipinnate, with gray-green bark. The flowers are small, with long yellow stamens, organized in glomeruli. Fructification pods are flattened. In open soil, plant in spring in drained soil, rather acidic, in the sun, warm. Dig a hole 20 cm larger than the root ball, and plant without burying the root collar. The mimosa has rather superficial roots: plan a stake firmly embedded beside the root ball, and attach it with one or two flexible links. Tamp the soil well as you place the plant in the hole - avoid mixing the soil layers if possible. It is not necessary to water. Do not plant two mimosas within 3 m of each other. In pots, plant in mixed loam with sand, and put gravel at the bottom of the tank for good drainage. Choose a pot proportionate to the expected development, knowing that a pot of 50 cm is suitable for a mimosa of 3 m height. Remove - or cut as appropriate! - the stake after two years. Trim your wattle after flowering in March. It's quite simple: cut the branches out by a half or even two thirds, to keep a compact habit. Before winter you can provide protection at base of your wattle: straw or dead leaves in thick layers will be fine! Every two or three years, replace only the top layer of the soil, adding some compost. The wattle is not greedy in water, but in a small pot it will meet its limits anyway. Wattle - Mediterranean plants - are naturally drought resistant and do not tolerate excess water. In the open soil, your mimosa will need regular contributions the first two summers, but not beyond. In pots, water the mimosas each week, spacing a little more if they are mulched in autumn. In winter, water once every two weeks. In any case, make sure that the substrate never becomes completely dry, and avoid limestone water, the rainwater would be perfect! Put your wattles in pots before winter, and store them away from frost, ideally in a cold room - less than 8 ° C - and especially not in the house! In April-May, take out your pots sheltered for the winter. If you see white floury patches on your mimosa, it is the victim of a mealy bug attack. If they are not too many, they can be removed by hand after a projection of black soap. In all cases, these parasites are not deadly for the plant.